1 Over medium-low heat, add the oil to a large skillet with the onion, garlic, and bay leaf, stirring occasionally, until the onion has softened. 2 Add the eggplant and cook, stirring occasionally, for 8 minutes or until the eggplant has softened. 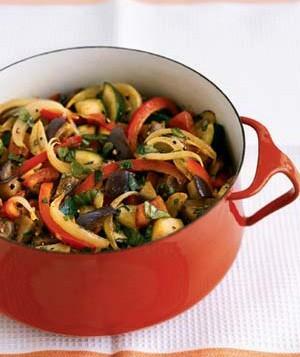 Stir in the zucchini, red bell pepper, tomatoes, and salt, and cook over medium heat, stirring occasionally, for 5 to 7 minutes or until the vegetables are tender. Stir in the basil and few grinds of pepper to taste.